The newly redesigned 2010 Lexus GX 460 has been announced today, which means plenty of information to cover—let’s start with some key points, followed by the official photo gallery and press release. An all-new 4.6-liter V8 producing 301 horsepower and 329 lb.-ft. of peak torque, paired with a new six-speed automatic transmission with sequential shift. EPA-estimated 15 mpg city and 20 mpg highway, which is 13% better than the outgoing GX 470. Standard Kinetic Dynamic Suspension System (KDSS) to help provide both exceptional on-road ride and handling and true off-road capability. Second row seating that slides 4.1 inches fore/aft to maximize passenger and cargo carrying ability, with a 60/40 walk-in function to access the standard power fold-flat third row seats. A rear door window with a flip-up glass panel. An optional Wide-view Front and Side Monitor (including display of both sides). The full Lexus USA press release after the jump. Positioned between the brand’s LX 570 premium luxury utility vehicle and unibody-based RX models, the 2010 GX 460 combines “right sized” midsize packaging with family-friendly comfort and premium craftsmanship. The GX 460 has a standard seven-passenger configuration. Once again built with rugged body-on-frame construction, the 2010 GX 460 is also equipped with full-time four-wheel drive and the advanced Kinetic Dynamic Suspension System (KDSS) to help provide both exceptional on-road ride and handling and true off-road capability. The 2010 Lexus GX 460 is powered by an all-new 4.6-liter V8 that is both more powerful and more efficient than the 4.7-liter V8 it replaces. The new engine produces 301 horsepower and 329 lb.-ft. of peak torque, and is teamed to a new six-speed automatic transmission with sequential shift. Combined city/highway fuel economy is improved by 13 percent to an EPA-estimated 17 mpg (vs. 15 mpg in the 2009 GX 470)—better than other V8 luxury utility vehicles and competitive with some six-cylinder models. The GX 460 has an EPA-estimated 15 mpg city and 20 mpg highway. Downhill Assist Control (DAC) is designed to augment the low-speed descending ability of the transmission’s low range by helping to hold the vehicle to a target speed with no intervention from the driver. Active traction control (A-TRAC) provides the traction benefits of having locking front and rear differentials, but with lower weight. The system can apply the brake to a slipping wheel, while transferring torque to the wheels with better traction. In addition, an available Pre-Collision System with Driver Attention Monitor and Lane Departure Alert (LDA) is now available for the 2010 GX 460. Using two small cameras mounted at the front of the vehicle that work in conjunction with millimeter-wave radar, the system is sensitive enough to detect certain nonmetallic objects. The Driver Monitor System uses a third camera, mounted on the steering column, monitors the orientation of the driver’s face. New for 2010, active front headrests move up and forward almost instantly in the event of certain lower speed rear-end collisions when the force of the occupant’s body is applied to the seat back. Also new, the available Adaptive Front lighting System (AFS), illuminates a turn or curve as the driver steers into it and includes high intensity discharge (HID) headlights. The available Pre-Collision System with Driver Attention Monitor Package includes new Intelligent High Beams with headlamp cleaners automatically adjust the high beams to avoid blinding drivers in oncoming vehicles. The cleaners help ensure optimal headlight performance in all weather conditions. 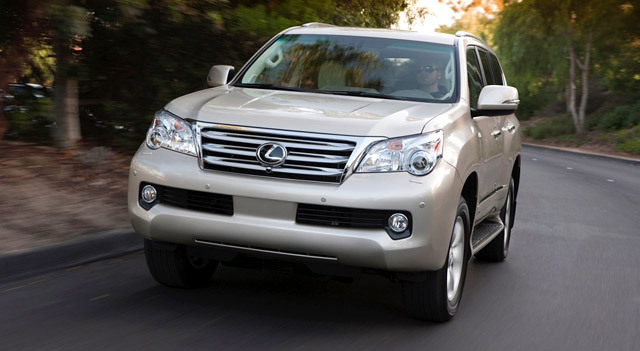 The GX 460 presents a luxurious passenger environment with the fit and finishes expected in a Lexus. Standard features include: eight-way power-adjustable, heated/ventilated front seats; automatic climate control; leather trimmed seats and surfaces; steering wheel audio controls; rain-sensing windshield wipers; power moonroof; a wood and leather-wrapped steering wheel and shift knob; memory system for the driver’s seat, steering wheel position and outside mirrors; and an overhead console with integrated HomeLink® transmitter. Lexus Insider™, a complimentary, opt-in service is also available without a subscription on all Lexus Enform-equipped vehicles. This feature offers in-vehicle audio casts that provide owners access to useful vehicle tips and event information, and insights into exclusive owners’ benefits – all designed to further enhance the Lexus experience.